One of the critical features of any successful Western blot is the highly specific interaction between an antibody and an antigen. The antigen, usually a protein or peptide, is the target of the antibody. The precise point of interaction is between a small region of the antigen, an epitope, and the recognition sites found on the arms of the antibody molecule. The antibodies used to detect the target protein in a Western blot will be either monoclonal or polyclonal . Both types of antibody are typically created when an antigen, usually a protein or peptide, is injected into an animal and its immune system responds by producing antibodies specifically targeted against that antigen (or more precisely to various epitopes found on that antigen). Polyclonal antibodies consist of a mixed pool of immunoglobulin molecules that bind to several different epitopes found on a single antigen . Polyclonals are usually produced in rabbits, donkeys, sheep, and goats, and are purified from serum. In contrast, monoclonal antibodies bind to a single epitope within a target antigen. Specificity for a single epitope. Varying specificities to multiple epitopes. 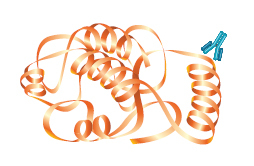 If there are no antibodies available to the protein of interest, it is still possible to carry out a range of immunodetection techniques, including Western blotting, by using epitope tags and matched epitope tag antibodies. This elegant strategy works by adding a small sequence of DNA that codes for a known antigenic epitope during cloning of the protein of interest . Since matched antibodies already exist that will specifically bind to this epitope, the target protein can be detected because it also expresses the appropriate epitope. Therefore, immunodetection can be carried out quickly and without the need to wait for the generation of unique antibodies to a newly identified target protein. This technology is also of significant benefit when working in organisms where few specific antibodies are readily available. One downside to this technology is that the target protein is altered by the addition of tag, and thus it is not identical to native forms of the protein. There are a wide variety of epitope tag antibodies available, including: His-6 antibody (MCA1396), V5-Tag antibody (MCA1360), c-myc antibody (MCA2200), and others which are supplied by Bio-Rad. Epitope tag antibodies are available with a range of common antibody labels allowing one to switch experimental techniques or detection systems without having to modify the target protein. In the Western blots shown below, myc-tagged KSr (Kinase Suppressor of ras) is detected through the use of either an anti-myc antibody or an anti-KSr antibody.